Emmanuel Episcopal Church, Little Falls. Each year, the Little Falls Historical Society honors Patriots Day by hosting an event at a local historical site. We have commemorated Patriots Day at Yellow Church Road Cemetery, at Herkimer Home, at Fort Herkimer Church, at Indian Castle Church, at Snells Bush Church, at Herkimer Reformed Church, and last year at Historic Trinity in Fairfield. 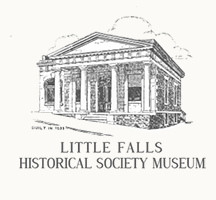 At the urging of the Little Falls Historical Society, the City of Little Falls, under the leadership of Mayor Robert Peters, established a local Patriots Day in 2010 to be celebrated each year on the third Saturday in May. This is in recognition of our local ancestors’ contributions to America’s quest for independence. Patriots Day is celebrated each year in most of New England to commemorate the April 15, 1775 Battles of Lexington and Concord which marked the beginning of the Revolutionary War. The first Patriots Day was declared in 1894. In 1938 the Commonwealth of Massachusetts established the third Monday in April each year as Patriots Day and it has become a civic holiday. Lexington and Concord have battle re-enactments and the City of Boston swells with activity and celebration.